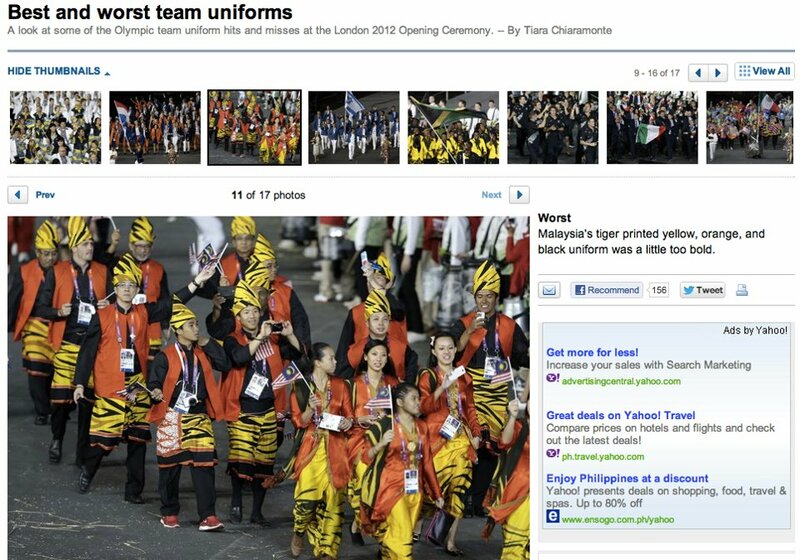 Malaysian Uniform Among The Worst During London2012 – footsteps……..
Oh My God! Our Malaysian Contingent has the worst uniform during the opening ceremony of London2012. I first saw it on Facebook. It was a screen capture from the internet. I goggled and found out it was on Yahoo Sports. The page consist of 17 thumbnails showing the best and worst uniforms. Even though it is not an official evaluation (I think), our uniform being shortlisted as among the worst should be taken into account and corrected by Malaysian Olympic Council, National Sports Council (representing Ministry of Youth and Sports) and Ministry of Unity, Culture, Arts and Heritage. The Malaysian uniform was described as Malaysia’s tiger printed yellow, orange, and black uniform was a little too bold. Maybe the authority in charge of dressing up our member of the Malaysian contingent had made a good choice but the colour did not please the Tiara Chiaramonte, who produce the article. Urghhh, that red sports shoe and his sampin spoil the uniformity. Else these guys and ladies looks nice. Maybe next time we put a Iban worrior on the first line among the men and see what Tiara will say. For once our sportsmen was dressed up with a Malaysian Touch and Flavour, the panglima look for the men while the ladies very feminine. As I can see (hope I am not mistaken) there is an essence of East Malaysia culture of the Bajaus or Suluk design. Besides Malaysia, Britian, Czech Republic, Canada, Germany, Ukraine, New Zealand and Mexico were also voted as worst uniforms. Meanwhile USA, Sweden, Brazil, Switzerland, Netherland, Isreal, Jamaica, Italy and France were voted as having the best uniforms. Note: There are spots fan asking why not fix to the Baju Melayu and Sampin Songket with a better moulded Tanjak than the simple one worn by Team Malaysia @ London2012. After all the view is just my 2 cents evaluation. Someone pulled a shifty on the Malaysian team and told them the opening ceremony was team fancy dress. i like malaysia dress, because it is their culture dressing, so it’s colourful and characterful.. and they make it interesting with harimau malaya (malayan tiger) stripes design in their sampin and kebaya dress.. malayan tiger are their nation symbol. Too bad… Coz u the fashion magazine editor… But u seems know notthing bout fashion… I think malaysian dress is classy.. Coz they wear thier traditional attire… Yes no guuci.. No prada.. No boss. No LV.. But not typical as other countries.. Come with a suit.. Like hello!